GENFIT is a software tool for analysing small-angle scattering (SAS) data from X-ray (SAXS) or neutron (SANS) experiments. It reads in a set of one-dimensional scattering curves and fits them using different kinds of models. SAS curves calculated from a model can be smeared to allow for the instrumental resolution. The user can fit the experimental data selecting one or more models from a list including more than 30 models, starting from simple asymptotic behaviours (Guinier's law, Porod's law, etc.) down to complete atomic structures. Some models, which are defined in terms of both form and structure factors, take into account the interactions between particles in solution. GENFIT is able to simultaneously fit more SAS curves via a unique model or a mixture of models. In the latter case, some specific model parameters can be shared by any selection of the experimental curves. Model parameters can be related to the experimental chemical-physical conditions (temperature, pressure, concentration, pH, etc.) by means of link functions, which can be freely defined by the user. On the other hand, GENFIT can be used to generate theoretical SAS curves from a given model and/or from the knowledge of the species in solution. It can hence be a useful instrument to find the optimum experimental conditions for a planned SAS experiment. 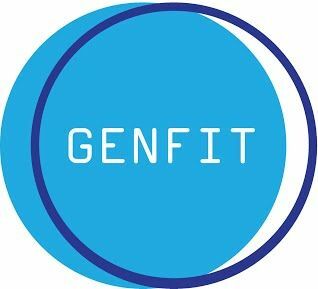 GENFIT is written in Fortran. Versions 2.0 and higher make use of a graphical user interface (GUI) to manage input files and execute the calculations.